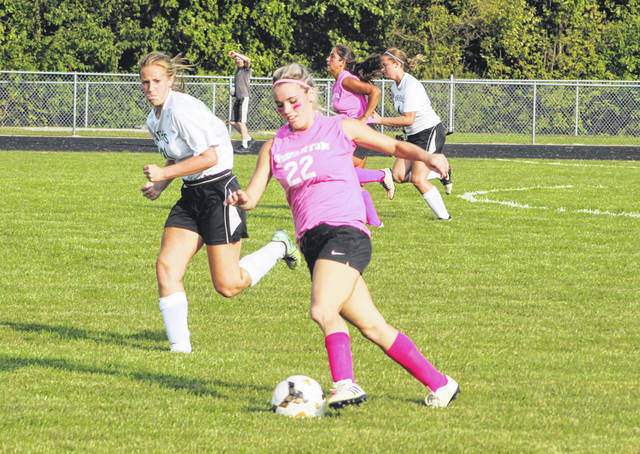 Swanton’s Bridget Harlett advances the ball in a game against Delta this season. Harlett received second team All-Ohio honors in Division III. A pair of area athletes were named second team All-Ohio when the all-state girls soccer awards were announced recently. Bridget Harlett of Swanton and Andi Peterson of Archbold received second team All-Ohio honors in Division III. Gabby Hollar of West Liberty-Salem was the Division III Player of the Year. Bailey Clark, sr., Chippewa; Alyssa Clason, sr., Grand Valley; Baylor Fortune, sr., Huron; Kylan Harper, sr., Bishop Rosecrans; Alex Hoeffel, jr., Continental; Gabby Hollar, sr., West Liberty-Salem; Laney Huber, sr., Cincinnati Hills Christian Academy; Madison Luckett, sr., Champion; Alanna Raikes, sr., Worthington Christian; Peyton Scott, sr., Lynchburg-Clay; Katelyn Setters, sr., Cincinnati Country Day; Kenna Souder, fr., Eastwood; Moriah Steffen, sr., Central Christian; Grace Todd, sr., Worthington Christian; Brooke Wilson, sr., Cuyahoga Heights; Brenna Woodard, sr., Preble Shawnee; Maya Zovko, jr., Kirtland. Player of the Year: Gabby Hollar, West Liberty-Salem. Coach of the Year: Edward Bradac, Kirtland. Tara Backerms, sr., Newton Falls; Carly Campo, jr. Crestview; Alexa Chieffo, jr., JFK; Lily Clark, jr., Zane Trace; Kristen Dickinson, sr., Milton Union; Emma King, fr., Manchester; Samantha Engler, soph., Liberty Center; Lexie Ensign, jr., Lordstown; Bridget Harlett, sr., Swanton; Heidi Hunter, sr., West Union; Bella Lorio, sr., Ottawa Hills; Natalie Koenig, soph., Miller City; Kylee Kosek, soph., Springfield; Lauren Langhals, sr., Kalida; Eva Lyon, sr., Miami Valley School; Sasha McConahay, jr., Northwestern; Maddie McConnahea, sr., Jefferson; Libby Miller, sr., Wheelersburg; Grace Monnin, sr., Lehman Caholic; Jill Newlan, soph., Smithville; Taylor Noll, jr., Anna; Holly Northcutt, sr., Brookville; Hannah Owens, sr., Eastwood; Andi Peterson, sr., Archbold; Taylor Pierce, soph., Grandview Heights; Avery Rice, jr., Lima Central Catholic; McKena Rice, sr., Alexander; Savanah Richards, sr., Liberty-Benton; Romiya Roth, fr., Beachwood; Faith Rutherford, jr., Greeneview; Kati Schiano, soph., The Columbus Academy; Addie Shock, sr., The Wellington School; Mary Sonner, jr., North Adams; Sydney Starr, sr., Harrison Central; Mia Wyrick, sr., Madeira; Marissa Young, sr., Genoa; Erika Zschuppe, fr., Kirtland; Makaylee Zuercher, sr., Loudonville.